Sarah Hyland Rocks New Haircut With Ariel Winter & Nolan Gould at ‘Modern Family’ Event | Ariel Winter, Modern Family, Nolan Gould, Sarah Hyland | Just Jared Jr.
Sarah Hyland, Ariel Winter, and Nolan Gould teamed up for the FYC Event for their show Modern Family! The trio stepped out for the event held at Avalon on Monday (April 16) in Hollywood. Their co-stars Ty Burrell, Julie Bowen, Jesse Tyler Ferguson, Eric Stonestreet, and executive producer Steven Levitan were also in attendance. Sarah – looking gorgeous in a strapless grey printed dress – showed off her brand-new haircut featuring blunt bangs! Head to our gallery to see all the pics. 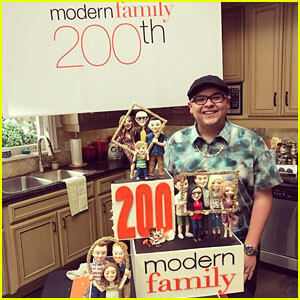 Modern Family airs Wednesdays at 9/8c on ABC. Season nine will resume on May 2. 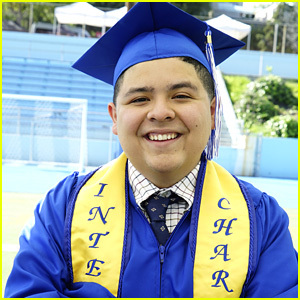 Rico Rodriguez & Nolan Gould Graduate on 'Modern Family's Season Finale!